Before we get to the news, a quick refresher for those who are new to this business. 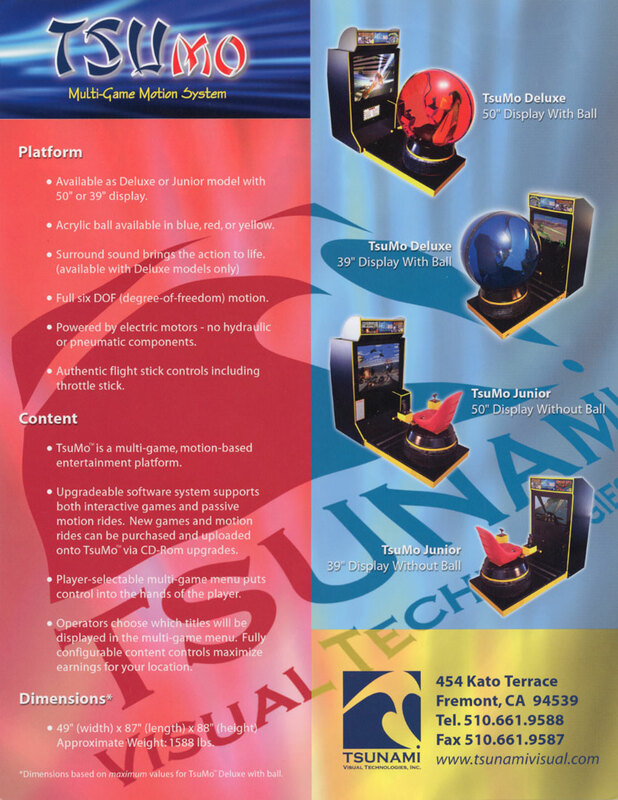 Virtual roller coasters have been a hot item in arcades since the early 2000s; some examples include the roller coaster experiences that were offered with the Tsunami Tsumo motion platform and Triotech’s Mad Wave Motion Theater. The best selling and earning motion ride out there has to be Triotech’s Typhoon, which lets 1-2 riders experience a roller coaster-like simulation set in various over-the-top situations. The name LAI Games should be familiar to those who enjoy videmption & redemption titles, they have focused mainly on those types of games but they have also released straight-up video arcade games, sports games (like arcade basketball machines), photo booths and more; Ubisoft for their part used to work with GlobalVR, releasing titles like Far Cry (as Paradise Lost) and Blazing Angels to the business. But it has been a while since we’ve seen the Ubisoft logo grace a new arcade experience. Ubisoft did unveil that they were working on a Rabbids VR ride experience back during E3 2015 while earlier this year a different Rabbids VR title was announced as being in the works. We are not sure which Rabbids VR software this is based on…it could be one of those or it could be unique to this hardware. That’s all we know for now. I imagine that there will be more than one scenario to choose and it likewise is a good idea to allow for additional “ride films” to be added to the game in the future. What do you think about this new product? A bit off topic but if anyone knows this you do. I am looking for a game from the 80s called Front Line. I had a joystick on the left and dial that controlled your gun or tank turret, you smacked down on the dial to shoot. It was my favorite. Yes, I do recall Taito’s Front Line upright arcade game cabinet. It appears for sale from time to time on eBay or you could check your local Craigslist listings to see if one is for sale. Of course, the actual Front Line PCB is non-Jamma to begin with (that’s a given in this day of age). My local arcade hangout called Tilt! used to have a Front Line cab that had a “green star” sticker on the front side portion placed near the coin slot mechanism section that meant you could get two games for one quarter back in 1984. Tilt! had a special promotion going on during that particular point in time that all arcade games that sported a “green star” sticker on it, 2 games for 1 quarter deal. So arcade games like Super Pac-Man, Space Duel, Front Line and the like, had a green star. How cool was that? I went to check out the new VR coaster. It was interesting, they had disposable masks that you would put on to prevent the VR headset from touching your face directly. These VR attractions that dont require an attendant to be there all the time are going to require consistent cleaning otherwise those headsets are gonna get nasty.